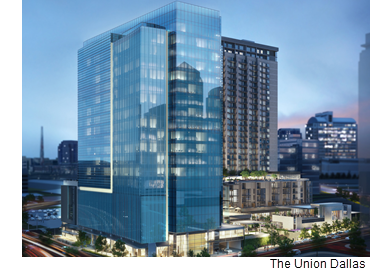 ​​​​​ ​DALLAS – Customer service giant Salesforce has signed a large, multi-floor lease in the new 22-story Union office tower in Uptown. Salesforce will consolidate workers from across the city. As part of the lease, Salesforce will have high-profile signage on the 420,000-sf office building, which opened in October. The office building, along with a 31-story, 309-unit apartment high-rise and a retail-and-restaurant center surrounding a half-acre park, is part of the $300 million Union project. ​See also: Dallas-Fort Worth-Arlington Office Market Research​.